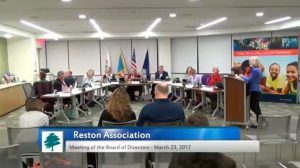 Under a new policy established by Reston Association’s Board of Directors, whistleblowers will be able to anonymously report violations of the law, RA’s deed, bylaws and policies or improper conduct to the board. On March 22, RA’s board voted to expand the policy, which currently allows violations to be reported up to the level of the CEO. Now, the board will directly hear violations. The association is also working with a third-party service provider to establish an anonymous reporting mechanism. The board’s treasurer Sridhar Ganesan, who worked with RA’s fiscal committee to push for the expansion, said RA still has to “conclude some procedural steps” like securing arrangements with the third party vendor before formally releasing the policy in its entirety. “I think this is very beneficial especially in light of all the processes and internal controls that we are implementing as an organization, including the purchasing resolution,” Ganesan said at RA’s meeting last week. Board Director John Mooney’s attempt to discuss the proposed policy during a special meeting at a later time failed. Mooney said he had hoped the board would take “a deliberative moment” to analyze the policy and ensure it independently assesses decisions made like the association’s controversial $2.65 million purchase of the Tetra property. “This policy is meant to prevent mistakes like many believe Tetra was,” Mooney said.